A whole year of days stretches out in front of us. Stretches out like a promise. And I pray that your 2014 is a year filled with mint-chip ice cream, fuzzy slippers, snow angels, great books, dark chocolate, sweet surprises at your front door, laugh-til-you-cry friends, good endings, the presence of mind to stop for someone who needs you, a perfect pair of jeans, take-your-breath-away sunrises, sentimental stories, fresh air in your lungs, thimbles of wine and pinches of bread at the altar, people to tell you how you matter, new starts, fresh dreams, and more love than your heart can hold. Our 2013 Highlights, in 38 seconds flat. We pitched hundreds of rocks into a lake, each rock bearing the named burden of a woman — burdens like fear, approval of others, not enough. We threw the rocks far, far away. And we’ve been reminding each other to keep our hands free. Because we can love better with empty hands. Most Treasured Ministry Moment with YOU! 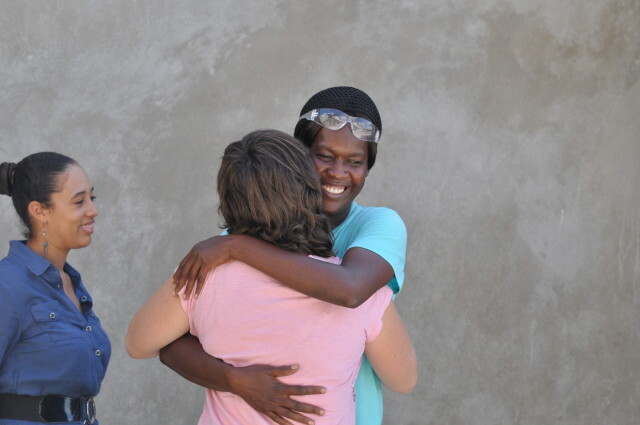 In less than two weeks, we raised more than $5,000 to build a house for Adeline in Haiti. And we did it by buying thousands upon thousands of dollars of ViBella Jewelry. On Black Friday, I was able to deliver the news, in person, to a very surprised and grateful Adeline. I tried to wrap the hugs of a thousand women, or more, into one tight embrace. I felt it in the depth of me — how Christ is still in the business of turning the darkest, blackest Fridays into Good Fridays. 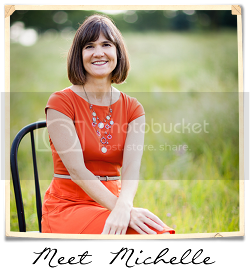 Ann Voskamp — a dear friend — invited me to her porch. We are both farmer’s wives, whose husbands like green tractors and pigs. 🙂 And she has been one amazing encourager in my writing journey, and in my faith life. You can find the post here: When It Seems Like It’s Just One Trouble After Another. Each week, I try to feature one #TellHisStory post from our linkup, by including it in the sidebar on the blog. One post, by Michelle DeRusha, still has me laughing out loud. Read it, and then bookmark it for Christmas 2014: One Small Thing (Done in Slightly Irritable Love). This book will help you rediscover — or discover for the first time — how beloved you are, and how that can really change everything. The Greatest Gift by Ann Voskamp. It’s hard to imagine a world without more books by Brennan Manning. He died April 12, 2013. 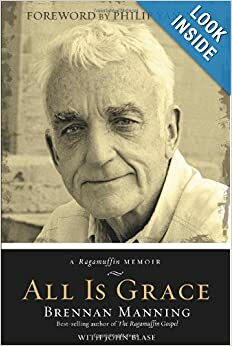 He has deeply influenced my spiritual life, and my thoughts on grace. I wrote my thanks to Manning here. I got an early peek at some great books that will be coming to a bookstore near you in 2014. You’ll love these. LOVE! 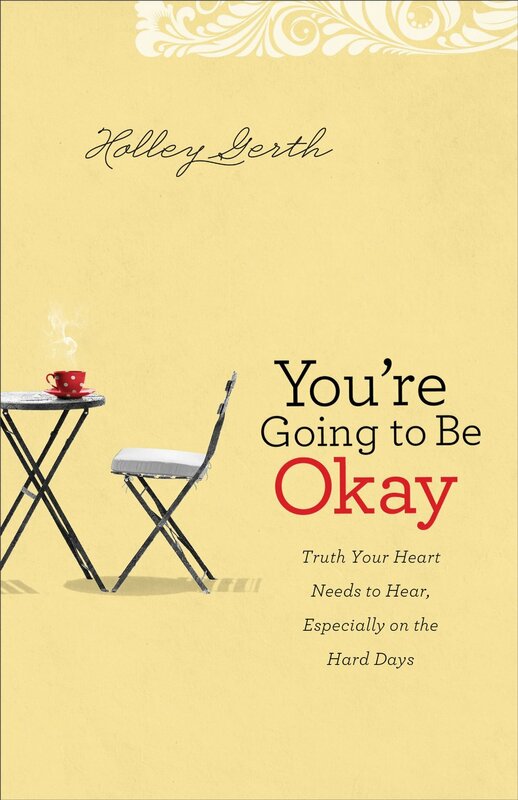 Holley Gerth’s latest book, You’re Going to be Okay, releases in February. This book is for every woman who has been disappointed, who has watched a dream die, whose life isn’t what she imagined it would be. Holley’s wisdom, authenticity, and warmth resonate on every page. We don’t get rote answers with Holley; we get a deep sense of how we are deeply loved by God, who meets us right where we are. You’re Going to Be Okay is a must-read. Also: Check out Holley’s new community of encouragement, Coffee for Your Heart, launching Jan. 1, 2014. You won’t want to miss it. Lisa Jo Baker’s debut work, Surprised by Motherhood, releases in April. This is the finest book on motherhood that I have ever read. Hands-down. With breathtaking prose, Lisa-Jo takes moms by the hand, and leads us straight into wonder, which we can find right next to our dirty dishes, Cheerio-strewn floors and overflowing diaper pails. This book is rocket fuel for mamas. And I am recommending this book to every mother I know. 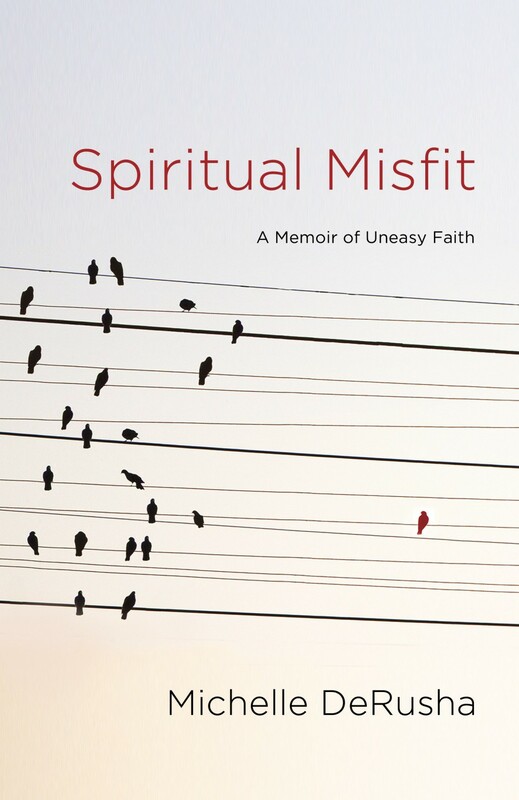 Michelle DeRusha’s memoir, Spiritual Misfit, also releases in April. This book is profoundly insightful and laugh-out-loud funny – the kind of book you carry with you to the kitchen sink and to the laundry room and even to the bathroom, because you can’t.stop.reading. Michelle is a master storyteller and brilliant writer. With candor and humor, Michelle picks up the pieces of her faith story (and her faithless story), then spreads them out on the pages like an offering. This book reveals a loving God who isn’t surprised or repelled by our misfit tendencies – but who pulls us closer. Spiritual Misfit is for any one of us who has ever groped through the dark – which is pretty much every one of us. This moment was a dream come true. I’ve written the words in this book for you, and while I poured myself out on the page, I felt God pouring in, changing me in the most profound ways. I can’t wait to tell you more. Stay tuned. Your turn! 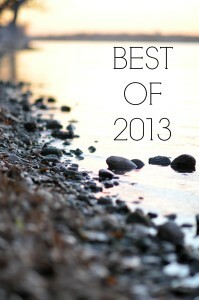 What’s on your “Best Of” list? Tell me about one of your best moments of 2013, and what most excites you about 2014. Feel free to share in the comments, or link with us here at #TellHisStory. I loved that video with the rocks and your precious girls! I remember when you posted it. Thanks for hosting! I hope you have a wonderful New Year! Thank you, Candace. It was a memorable afternoon for us. Unforgettable. Happy New Year. Happy New Year! I love your recap of 2013. I need to check out the books you’ve shared. Thank you for all your encouragement this past year. You are a blessing! Wishing you a joy-filled 2014. Hi Beth! I know you’ll love the books. I read all of them cover to cover, through a lot of laughter and tears. Happy New Year. So grateful for you and your friendship! You are a beautiful gift to this world, your readers, and my heart. Love you! Love you so, so big!! Those were precious moments, SHK. I’m so excited to see where your journey leads, especially your writing journey. I love your voice. You’ve got style, babe! So many beautiful moments. Happy New Year, Jennifer! Love to you. Happy New Year. Shine on! Love your “word” for 2014. Sweet! Can’t wait to read the other baby your getting ready to share with the world! Lovely recap Jennifer. And you are so generous with your platform, it is encouraging. Holding my glass up to 2014, its gonna be a wild ride huh? What a lovely surprise, Jennifer!! Thank you beyond words for your generosity. You are such an encouragement to me, personally. I thank God for you–one of the best people I’ve met in 2013! You are such a special lady. What I particularly loved on this New Year’s blog (besides your kindness to others) are the wonderful videos of you and your family. What a treasure this is and will be in years to come. And I shall never forget those two darling daughters of yours casting our stones in the waters of forgetfulness, so to speak. Mine was among them from the JT retreat, and I know that it is buried there, never to be dredged up again. Thank you for this blog, which also helps each of us revel in stones of remembrance that you place here several times a week….in remembrance of the One for whom the stone was rolled away once and for all! Glory! Have a wonderful New Year, and congratulations again on your new book. I canNOT wait to read it!!! Muchlove and Happy New Year! The pleasure is all mine. Your words were — and still are! — a gift. It has been a delight getting to know you and your heart here. Thank you for the community and the way you mentor and encourage. Thank you, Jennifer. Happy New Year! I feel the same about you. So glad to know you. What most excites me about 2014 are the POSSIBILITIES. That’s my word for this year! I am excited about what God will teach me this year! And I know it’s going to be awesome because my family is undergoing the hardest challenge in our lives! :^) Bless you dear sister! It was great journeying with you in 2013! Here’s to a wonderful 2014! God bless you, Patsy. Happy New Year. Thank you so much, sweet sister, for including my #TellHisStory post and my book in your Best of list – honored and humbled and excited! Love you, girl, and so delighted to be walking arm and arm into 2014 with you!. Your book is … oh, what’s the word ? … COMPLETELY FABULOUS!!!!! I told another friend about it tonight. It’s going to rock the world. Oh girl this is just beautiful! Beautiful. Can’t wait for those books and especially yours. Blessings, abundant ones, for 2014. Smooch… Just love you Alene. Would you pray just a single prayer? For the women who will hold the book. My knees are shaking. Smiling so big and wide whenever I am here. But especially big at the recap of glorious joy and goodness in the past year. As well as hearing your book news again, afresh, so excited with you and for you. News about the book so soon. And thank you for staying so close, E. Pray? It’s kind of nerve-wracking .Won’t lie. Praying. And when it flies out of your nest, just ask me and I will gladly shout it out ( and read it) from my place. A whole lot of Amen to that, friend. Can’t believe I got to meet you!